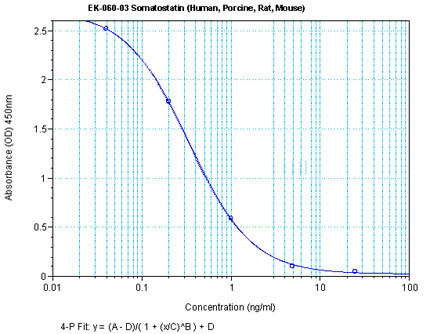 Somatostatin, also known as growth hormone-inhibiting hormone (GHIH) or somatotropin release-inhibiting factor (SRIF) or somatotropin release-inhibiting hormone, is a peptide hormone that regulates the endocrine system and affects neurotransmission and cell proliferation via interaction with G-protein-coupled somatostatin receptors and inhibition of the release of numerous secondary hormones. Somatostatin has two active forms produced by alternative cleavage of a single preproprotein: one of 14 amino acids, the other of 28 amino acids. In all vertebrates, there exists six different somatostatin genes that have been named SS1, SS2, SS3, SS4, SS5, and SS6. Tetrapods possess only SS1 and SS2, whereas teleost fish possess SS1 - SS6. The six different genes along with the five different somatostatin receptors allows somatostatin to possess a large range of functions. 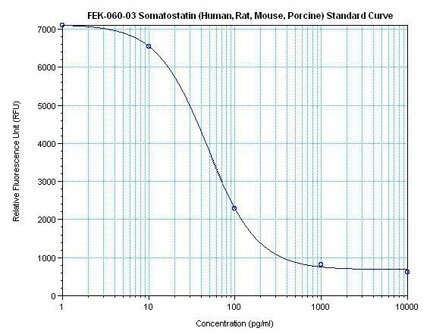 Neuronostatin, a recently discovered peptide derived from the somatostatin preprohormone, significantly inhibited both food and water intake when administered centrally in adult male rats. Neuronostatin: Peripheral site of action in mouse stomach. Neuronostatin is a 13-amino acid peptide encoded by somatostatin gene. It is distributed in different organs including gastrointestinal tract and has been involved in the control of food intake and gastrointestinal motility, likely through an action in the brain. So far, there are no reports about the occurrence of peripheral action sites in the gut. Therefore, the purpose of the present study was to examine, in the mouse, the effects of peripheral administration of neuronostatin on food intake within 24h and on gastrointestinal motility and to analyse neuronostatin actions on the gastric and intestinal mechanical activity in isolated preparations in vitro. When compared with PBS-treated mice, intraperitoneal neuronostatin reduced food intake in doses ranging from 1 to 15ng/g b.w. 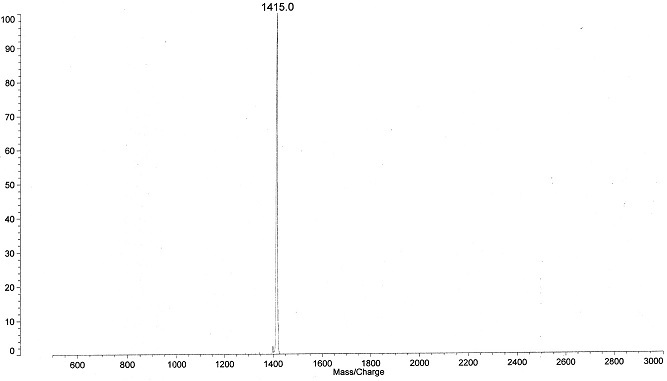 only in the first hour postinjection with a maximum effect obtained at the dose of 15ng/g b.w. (-46.9%). The peptide (15ng/g b.w.) significantly reduced gastric emptying rate (-31.1%) and gastrointestinal intestinal transit. Non-amidated neuronostatinfailed to affect food intake, gastric emptying and intestinal transit, suggesting the specificity of action. In vitro, neuronostatin induced concentration-dependent gastric relaxation, which was abolished by tetrodotoxin. Neuronostatin failed to affect the spontaneous mechanical activity or the evoked cholinergic contractions in duodenum. These results suggest that exogenous neuronostatin is able to reduce mouse gastric motility by acting peripherally in the stomach, through intramural nervous plexuses. This indirectly action could cause reduction of food intake in the short term. Amato A, Baldassano S, Caldara G et al., Peptides. 2014 Dec 22;64C:8-13. doi: 10.1016/j.peptides.2014.12.003. Neuronostatin attenuates myocardial contractile function through inhibition of sarcoplasmic reticulum Ca2+-ATPase in murine heart. BACKGROUND/AIMS: Neuronostatin, derived from the somatostatin preprohormone, was recently identified to be produced by several tissues exerting a role in cardiovascular regulation and metabolism. Nonetheless, the precise mechanism behind neuronostatin-elicited myocardial responses remains elusive. METHODS: This study was designed to elucidate the impact of neuronostatin on cardiac contractile function and the underlying mechanism of action involved. Adult male C57 BL/6 mice were subjected to a bolus injection of neuronostatin (50 μg/kg, i.p.). Echocardiographic, cardiomyocyte contractile and intracellular Ca2+ handling properties were monitored to evaluate the effect of neuronostatin on cardiac function. Western blot analysis was used to examine potential signaling mechanisms involved. RESULTS: Neuronostatin administration suppressed myocardial and cardiomyocyte contractile function and disturbed intracellular Ca2+ homeostasis. We observed enlarged LVESD (with unchanged LVEDD), reduced fractional shortening, depressed peak shortening, maximal velocity of shortening/relengthening, resting and electrically-stimulated rise in intracellular Ca2+, and prolonged relengthening duration in hearts from neuronostatin-treated mice. These effects were accompanied by downregulation of phosphorylation of sarcoplasmic reticulum Ca2+- ATPase (SERCA) and phospholamban (PLB) and activation of AMPK. CONCLUSION: Our data suggest that the cardiac depressant properties of neuronostatin possibly associated with loss of SERCA phosphorylation and AMPK activation. These findings revealed a potent inhibitory capacity for neuronostatin on cardiac function, the physiological relevance of which deserves further study. Zhu X, Hu N, Chen X et al., Cell Physiol Biochem. 2014;33(6):1921-32. Neuronostatin inhibits glucose-stimulated insulin secretion via direct action on the pancreatic α-cell. 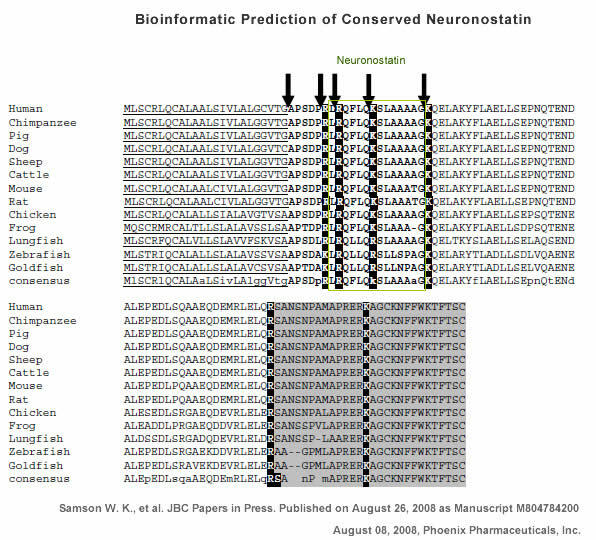 Neuronostatin is a recently described peptide hormone encoded by the somatostatin gene. We previously showed that intraperitoneal injection ofneuronostatin into mice resulted in c-Jun accumulation in pancreatic islets in a pattern consistent with the activation of glucagon-producing α-cells. We therefore hypothesized that neuronostatin could influence glucose homeostasis via a direct effect on the α-cell. Neuronostatin enhanced low-glucose-induced glucagon release in isolated rat islets and in the immortalized α-cell line αTC1-9. 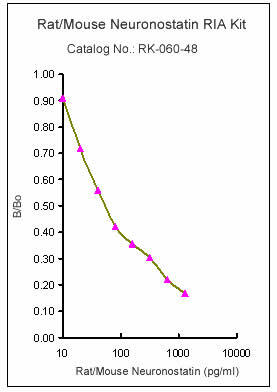 Furthermore, incubation with neuronostatin led to an increase in transcription of glucagon mRNA, as determined by RT-PCR. Neuronostatin also inhibited glucose-stimulated insulin secretion from isolated islets. 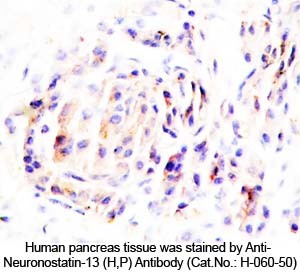 However, neuronostatin did not alter insulin release from the β-cell line INS 832/13, indicating that the effect of neuronostatin on insulin secretion may be secondary to a direct action on the α-cell. In agreement with our in vitro data, intra-arterial infusion of neuronostatin in male rats delayed glucose disposal and inhibited insulin release during a glucose challenge. These studies suggest that neuronostatin participates in maintaining glucose homeostasis through cell-cell interactions between α-cells and β-cells in the endocrine pancreas, leading to attenuation in insulin secretion. Salvatori AS, Elrick MM, Samson WK et al., Am J Physiol Endocrinol Metab. 2014 Jun 1;306(11):E1257-63. doi: 10.1152/ajpendo.00599.2013. Epub 2014 Apr 15. Neuronostatin ameliorates sodium taurocholate-induced acute pancreatitis in rats. BACKGROUND AND AIMS: Neuronostatin is encoded in the preprosomatostatin gene and exerts important physiological actions on neuronal and cardiovascular regulation and metabolism in diverse tissues. An intraperitoneal injection of neuronostatin can induce c-Jun expression in the periphery of pancreatic islets. 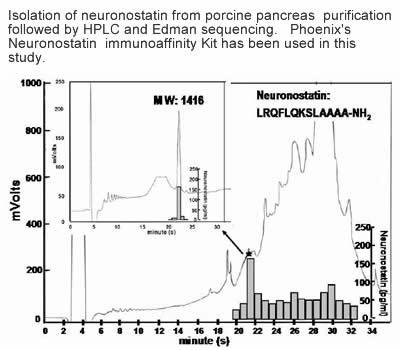 Because of the relatively high amount of neuronostatin present in the pancreas, it is necessary to investigate the effects of neuronostatin on pancreas. Furthermore, little is known about the effect of neuronostatin on acute pancreatitis. METHODS: Neuronostatin (30, 60, and 120 nmol) was injected in to the external jugular vein 30 min before retrograde infusion of 2 % sodium taurocholate into the pancreaticobiliary duct. After 6 h, histological damage of the pancreas was evaluated by pancreas weight and paraffin section. A blood sample was collected to determine the serum amylase and lipase activities. RESULTS: In our findings, neuronostatin groups had a reduction in interstitial edema, acinar cell vacuolization, and inflammatory infiltration of the pancreas compared with the model group. Biochemical data showed that serum amylase and lipase activities were significantly decreased inneuronostatin-pretreated groups by comparison with the model group. 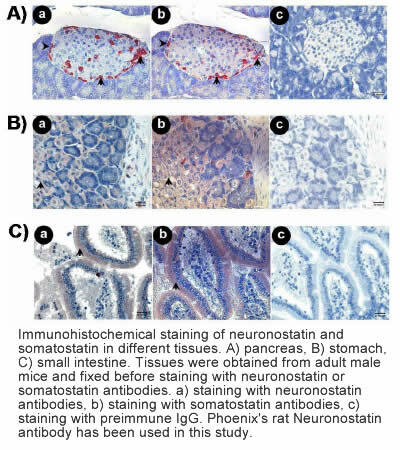 CONCLUSIONS: Histopathologic examination suggests that neuronostatin ameliorated the histological damage of sodium taurocholate-induced acute pancreatitis in rats. The biochemical analysis was consistent with that obtained from histopathologic examination, which was toward a trend of attenuating acute pancreatitis. In summary, neuronostatin might be potentially capable of ameliorating pancreatic damage in acute pancreatitis in rats. Mo J, Yang A, Chen Z et al., Dig Dis Sci. 2013 Oct;58(10):2903-7. The melanocortins, not oxytocin, mediate the anorexigenic and antidipsogenic effects of neuronostatin. 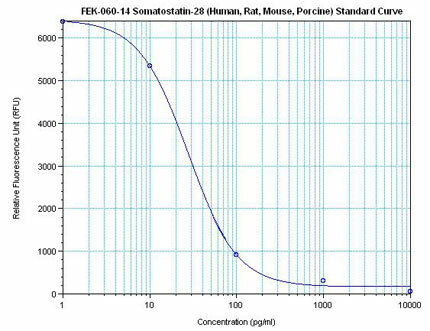 Neuronostatin, a recently discovered peptide derived from the somatostatin preprohormone, significantly inhibited both food and water intake when administered centrally in adult male rats. Because neuronostatin is highly produced in the hypothalamus, an area of the brain through which important feeding circuits, including the central melanocortin system, communicate, we sought to determine if the anorexigenic and antidipsogenic effects of neuronostatin would be reversed by pretreatment with the melanocortin 3/4 receptor antagonist, SHU9119. SHU9119 pretreatment reversed the effect of neuronostatin on both food and water intake. We have shown recently that the central oxytocin system is a potential downstream mediator of the anorexignic action of alpha-MSH. We therefore tested whether the effects of neuronostatin also were dependent upon central oxytocin receptors. Neuronostatin-induced anorexia was not reversed by pretreatment with the oxytocin receptor antagonist, OVT, suggesting that neuronostatin acts through a unique subset of POMC neurons that do not signal via central oxytocin receptors. Neuronostatin is co-expressed with somatostatin and mobilizes calcium in cultured rat hypothalamic neurons. Neuronostatin (NST) is a newly identified peptide of 13-amino acids encoded by the somatostatin (SST) gene. Using a rabbit polyclonal antiserum against the human NST, neuronostatin-immunoreactive (irNST) cells comparable in number and intensity to somatostatin immunoreactive (irSST) cells were detected in the hypothalamic periventricular nucleus. Fewer and/or less intensely labeled irNST cells were noted in other regions such as the hippocampus, cortex, amygdala, and cerebellum. Double-labeling hypothalamic sections with NST- and SST-antiserum revealed an extensive overlapping of irNST and irSST cells in the periventricular nucleus. 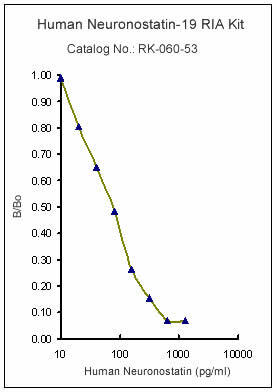 Pre-absorption of the NST-antiserum with NST (1 microg/ml) but not with SST (1 microg/ml) abrogated irNST and vice versa. The activity of NST on dissociated and cultured hypothalamic neurons was assessed by the Ca(2+) imaging method. 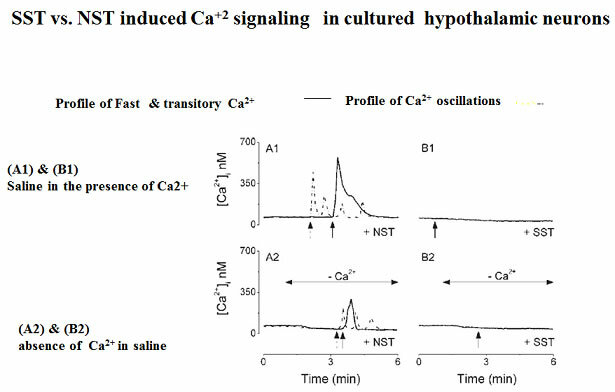 NST (10, 100, 1000 nM) concentration-dependently elevated intracellular Ca(2+) concentrations [Ca(2+)](i) in a population of hypothalamic neurons with two distinct profiles: (1) a fast and transitory increase in [Ca(2+)](i), and (2) an oscillatory response. Whereas, SST (100 nM) reduced the basal [Ca(2+)](i) in 21 of 61 hypothalamic neurons examined; an increase was not observed in any of the cells. Optical imaging with a slow-responding voltage sensitive dye DiBAC(4)(3) showed that NST (100 nM) depolarized or hyperpolarized; whereas, SST (100 nM) hyperpolarized a population of hypothalamic neurons. The result shows that NST and SST, though derived from the same precursor protein, exert different calcium mobilizing effects on cultured rat hypothalamic neurons, resulting in diverse cellular activities. Dun et al. Neuroscience. 2010 Mar 17;166(2):455-63. Neuronostatin inhibits cardiac contractile function via a protein kinase A- and JNK-dependent mechanism in murine hearts. Neuronostatin, a newly identified peptide hormone sharing the same precursor with somatostatin, exerts multiple pharmacological effects in gastrointestinal tract, hypothalamus, and cerebellum. 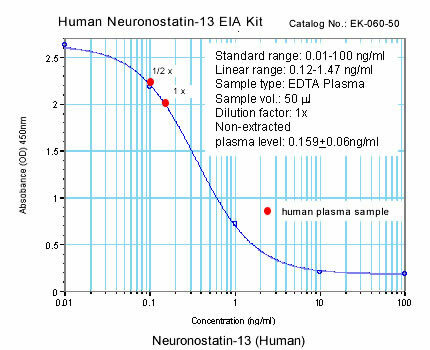 However, the cardiovascular effect of neuronostatin is unknown. The aim of this study was to elucidate the impact of neuronostatin on cardiac contractile function in murine hearts and isolated cardiomyocytes. Short-term exposure of neuronostatin depressed left ventricular developed pressure (LVDP), maximal velocity of pressure development (+/-dP/dt), and heart rate in Langendorff heart preparation. Consistently, neuronostatin inhibited peak shortening (PS) and maximal velocity of shortening/relengthening (+/-dL/dt) without affecting time-to-PS (TPS) and time-to-90% relengthening (TR(90)) in cardiomyocytes. 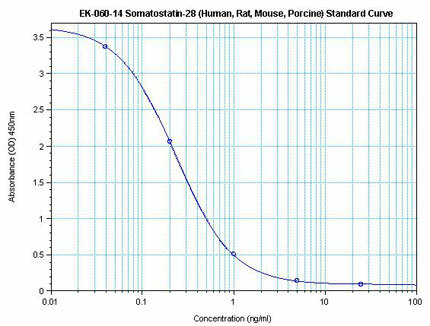 The neuronostatin-elicited cardiomyocyte mechanical responses were mimicked by somatostatin, the other posttranslational product of preprosomatostatin. Furthermore, the neuronostatin-induced cardiomyocyte mechanical effects were ablated by the PKA inhibitor H89 (1 microM) and the Jun N-terminal kinase (JNK) inhibitor SP600125 (20 microM). The PKC inhibitor chelerythrine (1 microM) failed to alter neuronostatin-induced cardiomyocyte mechanical responses. To the contrary, chelerythrine, but not H89, abrogated somatostatin-induced cardiomyocyte contractile responses. Our results also showed enhanced c-fos and c-jun expression in response to neuronostatin exposure (0.5 to 2 h). Taken together, our data suggest that neuronostatin is a peptide hormone with overt cardiac depressant action. The neuronostatin-elicited cardiac contractile response appears to be mediated, at least in part, through a PKA- and/or JNK-dependent mechanism. Hua et al. Am J Physiol Regul Integr Comp Physiol. 2009 Sep;297(3):R682-9. Neuronostatin encoded by somatostatin gene regulates neuronal, cardiovascular, and metabolic functions. 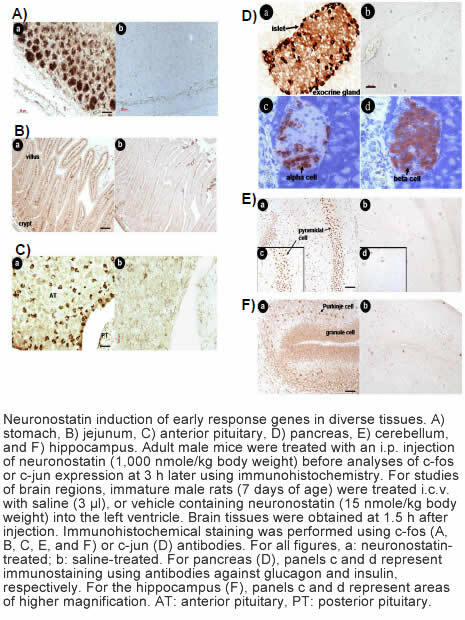 Somatostatin is important in the regulation of diverse neuroendocrine functions. 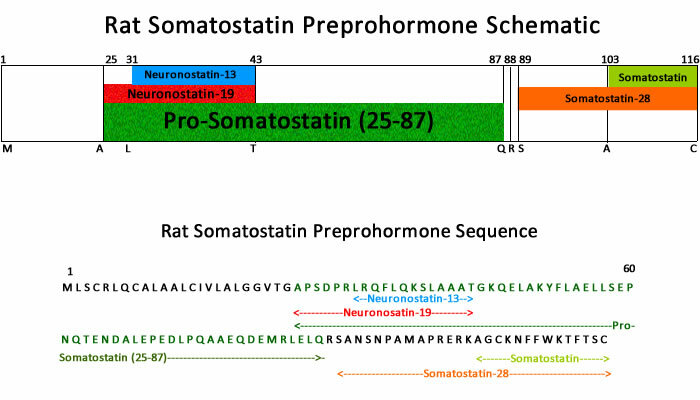 Based on bioinformatic analyses of evolutionarily conserved sequences, we predicted another peptide hormone in pro-somatostatin and named it neuronostatin. Immuno-affinity purification allowed the sequencing of an amidated neuronostatin peptide of 13 residues from porcine tissues. In vivo treatment with neuronostatin induced c-fos expression in gastrointestinal tissues, anterior pituitary, cerebellum, and hippocampus. In vitro treatment with neuronostatin promoted the migration of cerebellar granule cells and elicited direct depolarizing actions on paraventricular neurons in hypothalamic slices. In a gastric tumor cell line, neuronostatin induced c-fos expression, stimulated SRE-reporter activity, and promoted cell proliferation. Furthermore, intracerebroventricular treatment with neuronostatin increased blood pressure but suppressed food intake and water drinking. Our findings demonstrate diverse neuronal, neuroendocrine, and cardiovascular actions of a somatostatin gene-encoded hormone and provide the basis to investigate the physiological roles of this endogenously produced brain/gut peptide. Samson et al. J Biol Chem. 2008 Nov 14;283(46):31949-59. Endogenous peptide discovery of the rat circadian clock: a focused study of the suprachiasmatic nucleus by ultra-high performance tandem mass spectrometry. Understanding how a small brain region, the suprachiasmatic nucleus (SCN) can synchronize the body's circadian rhythms is an ongoing research area. This important time-keeping system requires a complex suite of peptide hormones and transmitters that remain incompletely characterized. 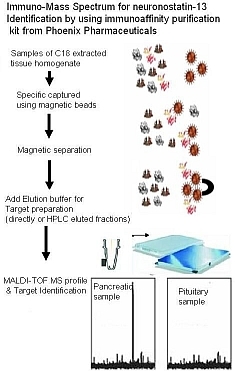 Here, capillary liquid chromatography and Fourier-transform mass spectrometry (FTMS) have been coupled with tailored software for the analysis of endogenous peptides present in the SCN of the rat brain. 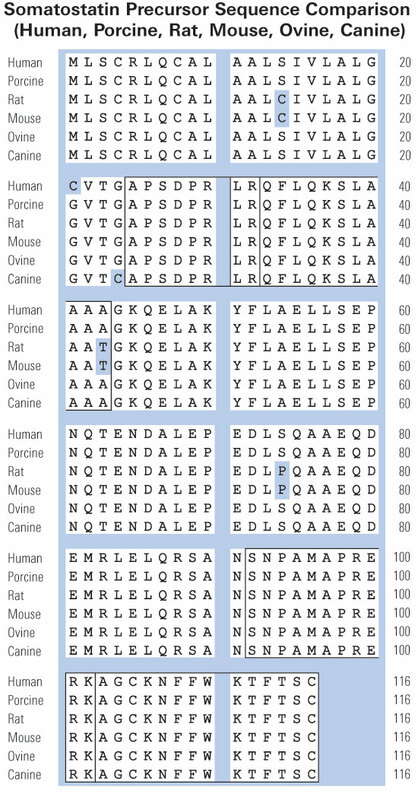 After ex vivo processing of brain slices, peptide extraction, identification and characterization from tandem FTMS data with <5 ppm mass accuracy produced a hyper-confident list of 102 endogenous peptides, including 33 previously unidentified peptides, and 12 peptides that were post-translationally modified with amidation, phosphorylation, pyroglutamination, or acetylation. This characterization of endogenous peptides from the SCN will aid in understanding the molecular mechanisms that mediate rhythmic behaviors in mammals. Lee et al. Mol Cell Proteomics. 2009 Nov 10.